Since Balenciaga's hey day during the 50s, the revered house has gone from strength to strength. Today with the uber- talent Alexander Wang at the helm, the label continues apace with it reputation for designing boundary-pushing, inventive fashions that are as elegant as they are modern. Season after season serious fashion lovers turn to this world-class French label for sophistication blended with a contemporary edge. Capture some of the timeless magic with Balenciaga scarves. 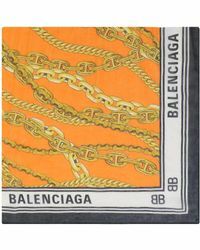 Showing 465 results for "Women's Balenciaga Scarves"